Artemis was the daughter of Zeus and Leto. She had a twin brother called, Apollo. Artemis and Apollo had a lot of differences. It took a lot for Apollo to get angry because he was usually a pretty gentle and warm-hearted man. As for Artemis, she was nearly always cold and pitiless and the only other thing that Artemis loved besides her family was floppy-eared dogs. Artemis was the greek goddess of The Moon, hunting, archery, childbirth, and wild animals. She was normally potrayed as living in the countryside. She had the ability to send horrible plagues and sudden death to mortals but she also had the ability to heal them as well. Her symbols include: A Bow and Arrow, wild animals, and she often wears the Lunar Crescent on her brow. Artemis was one of the three goddesses who swore never to marry. (The other two goddesses were Hestia and Athena). Actaeon was was one of the famous hunters in the 16th Century. One day, while he was hunting in the woods, he and his hunting dogs stumbled upon some noises nearby. Actaeon listened carefully. It was the sound if merriment coming from a nearby stream. Actaeon was curious to see who or what it was, so, he queitly approached the nearby stream. He hid behind the trees oto make sure that whoever it was couldn't see him. 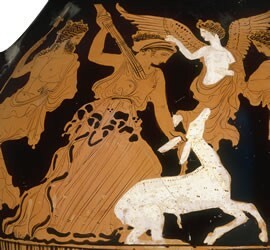 Actaeon saw the goddess, Artemis and her nymphs/assistants bathing in the stream. Actaeon wanted to step out of the trees and show himself but he was famous, foolish, and arrogant and what he should have done was to turn around and leave. But then, he stepped boldly out of the trees and looked at the goddess. Artemis was furious that a mortal could see him. So, she splashed him with water. The water turned him into a deer. Actaeon's hunting dogs could no longer recognise him in hise new form, so, they hunted him down, killed him, and ate him! Then, Artemis went back to bathing!